I would like to take this opportunity to present to you the latest and greatest of a long list of "interesting" novice areas. I can only wish the best of luck to whomever may decide to settle there. I can also not refrain myself from asking (yet again) what the intended experience of the players in such an area may be. Do you think we enjoy having to evict the inhabitants of such areas? PS: Please reconsider this behavior. Why is the cooldown for this area 19 days? So far it was always 14 days, or did I miss something? I think the incomplete sector ones were recently increased to 20ish days. Other than being incredibly annoying for the current (experienced) inhabitants of a block, this must be utterly demotivating for new/restarting players that (unknowingly?) settle in one of these zones. Finding the motivation and dedication to keep playing this game is hard enough as it is, and throwing new(er) players straight into the jaws of the sharks doesn't help a bit to keep them interested to keep paying for a subscription. TLDR; I think these blocks hurt the experience for all players involved and should be avoided. There are players who don't even start playing because there just isn't any good spots to spawn. And then there are players who start the game, spawn into one of these deathtraps the game calls novice areas, and quit after they get obliterated when the novice period ends. I think more consideration should be done on how to make new players have a good first experience of the game and to nurture the growth of the player base. I started on the border between NATO and Thunderkittens, in a novice zone created in the wake of a small war. It took about half of my 20 days to demonstrate that I could write at least passably competent code, and then one of the adjacent alliances invited me to join them. I think part of the problem is whatever game mechanics lead to there being huge swaths of unclaimed territory in the middle of mature neighborhoods. Those spaces SHOULD be full of smaller players, at the very least. Bigger players emptying out territory they aren't going to exploit should be disincentivized in some way. I also wonder whether there is any benefit to any players by re-purposing empty space such as this into novice zones. We are a bunch of sharks and we eat newer players alive so that they don't grow to be a threat on our doorstep... "no neighbors == good neighbors"! Are new players warned that certain novice zones are in pools of sharks? Maybe they should be warned that certain novice zones are dangerous. Maybe new sectors could be green novice zones, but re-purposed areas could be yellow novice zones? That way they know that it will take work to survive, living among warlords. Because truthfully, it's breaking my heart having to destroy so many novice rooms! Atavus, you still seem to not get the entire point of novice areas. They are not supposed to be a starter platofrm to further growth of players in this region. They are simply a place to mess with the game for 15-20 days, and decide what to do next based on this limited experience. Also, please post your thoughts in one corresponding thread rather than create new threads for every case on this subject. The point of this topic is exactly about players experience. What we observe is slowed expansion for high lev players (as if we needed it) and inappropriate starting point for novices. I agree with Tanjera idea of making a distinction between border novice areas and those within shark's basin. Another color and maybe a limited access to GCL5+ players could improve the experience of both newcomers and installed players. I myself grew up in such a novice area and had a great experience from that place, so let me be clear I don't want to see all the mechanism disappear but instead add some improvements to players XP. I think my good experience is linked to a good neighborhood and a decent amount of implication from myself. The second point is obvious, If you want to grow in sush place you have to make it fast. The first point is more important in the mechanism I have in mind. You could for example define Rookie areas only accessible to GCL5+ if neighborhood is mainly composed of GCL10+. At the time when I grew up my neighborhood was composed with ~1-2 months players so I had a chance to make a place for myself. Now, the novice areas spawning around don't let any chance to survive for novice players surrounded by GCL10+ players, they don't have neither time nor space to grow. 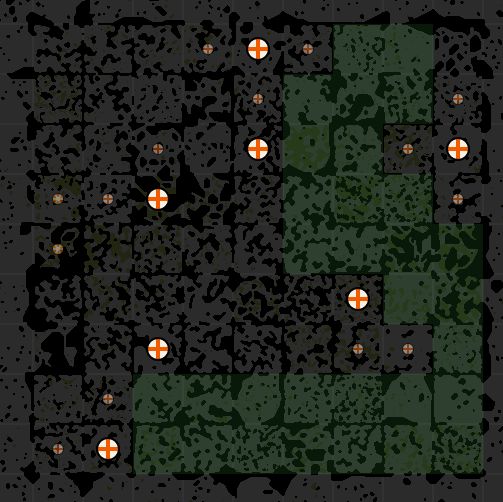 The idea to add a second level of such areas is to allow access to players who respawn after a war and to improve their ability to find a decent place to do so. For those experienced players, spawning in a border area is a slow grow option and spawning in an inner area is more a challenge about expansion and diplomacy. The point here is to decrease frustration of both old and new players facing these areas. Thanks for your reactivity, It's really appreciated to be able to discuss such topic with you! I apologize, but I am indeed having difficulties understanding the purpose of these zones. From your feedback in the recent discussions on this topic, I was under the impression that these areas were to stimulate a higher density of players in the map. Your reply now, suggests otherwise. I would like to address both possible intentions just in case. First, these areas do not increase player density in the map because they get fully cleared in 95% of the cases once they open. Second, are these "experimentation" zones really fruitful? These areas generate frustration for the players affected by them. The majority of players joining the game which may make use of these areas are not aware of these limits. They settle there hoping to carve out an empire of their own. It is unfair for both sides. Is the experience of a new player better in a proper novice area or in the makeshift zones? Are the random novice areas generating frustration for existing players? Answering these two questions, makes the discussion much easier. I would also like to point out, that the fear of empty areas suddenly covering the map is unjustified. Deadlypineapple despawned recently and his area was gobbled up within a few days. Veteran players are constantly being pushed out from the map center and currently have no real choice but to spawn into the novice areas. I think what bugs me the most about this is that Atlan is clearly active. He has occupied that sector for over a month now. He dropped some of his reservations for 3 days to engage in war against Opptic and Magnus from E5S45. I can only imagine what a complete disaster this novice area would have been if the war would have lasted a bit longer. Doing this repeatedly is seen as an insult by the veteran players. You are risking the loss of dedicated, active and paying members of the community, for no real reason. PS: This post is justified because it deals specifically with the creation of a dysfunctional novice area. The post by Dissi on this topic was a complaint about the frequency with which these areas get regenerated. My first post about this topic was a complaint about the logic of these areas and the fact that the mechanism was not documented at all. Atavus, you still seem to not get the entire point of novice areas. They are not supposed to be a starter platofrm to further growth of players in this region. I agree with Bonzai and Atavus. It's absolutely bad for new player experience. I wipe my novice zone out every time. It takes time, it's tedious and not fun at all. I've also NEVER seen a player respawn after I wiped out their base. Meaning I'm essentially wiping out your revenue streams. I agree this is a really bad mechanic, but there also needs to be something done about stronger players owning 4-5 blocks with only a few rooms in each block (so huge open spaces that now gets turned into novice areas). If the older players end up having no conflict because they have so many options of new rooms and no players ever dare to spawn near them it will also get boring. Maybe we should try to get a mechanic to prevent it from being needed for novice areas to spawn like that. For example limit the amount of blocks a player can claim in based on their GCL. For example you can claim in a new block every 10 GCL's forcing you to own more rooms per area (just an idea will obviously need some work to be practical). I disagree. If a player is afraid of respawning and losing his 15-days old novice rooms, then probably Screeps is not a good choice for him (at least the official world). His real investment was to produce the code, not the structures. I’ve also NEVER seen a player respawn after I wiped out their base. Meaning I’m essentially wiping out your revenue streams. We’ve seen it hundreds of times though. Aside from proximo who spawned in that area no-one respawned yet. @chaos the issue you bring forth has not happened anywhere so far. I'd suggest we deal with such a problem should it actually occur. I got an interesting idea of how to prevent such rooms to be noviced, and also warn other players to not spawn in it. If the controller is “signed” recently, then this room won’t be converted to a novice area, and this warning will clearly explain some player intentions. The experience for all players will be worse if we stop making novice areas in inner regions, and desolate empty spaces begin to grow.